In the summer of 2010, I lost 40 pounds in three months and one day. I even came close to losing 20 pounds in one month. I did this using a commonly used business process in combination with arguably the most important business tool of the 20th century. This article will describe how I motivated myself and tracked the right key performance indicators to get myself in shape – and hopefully to maintain it. The process is tracking and controlling Key Performance Indicators. Key Performance Indicators provide knowledge that can motivate, enforce a behavior, require an action, prove a relationship between cause and effect, and more. Key Performance or as some call them Key Success Factors are used in almost every business but in many ways they are highly underutilized. How many key performance indicators have you seen posted on bulletin boards over the years that include things like stock price, profit, safety of entire company, etc. They might be great measures of a company’s success but to those of us in at the plant – they are about as key to our performance as barometric pressure, temperature and hours of sunlight in a day. We can’t control any of them. The greatest business tool of the 20th Century might be the computer – but as far as software goes it is probably the Spreadsheet program. I use Excel® everyday for a dozen different purposes and yet I see manufacturing managers that are far more expert than I am – and some that are literally managing almost every facet of their business using Excel®. Go to the bulletin boards in every plant and you will see dozens of beautiful graphs, charts, and trends that explain important information. The thing is manufacturing needs a system that is one version of the truth, easily automated with real-time data from existing source, contains business rules, and presents the information in real-time in the format needed by the audience. Oops, I got carried away. Now – I want to focus now on the selection and tracking of the right KPIs to achieve weight lose goals. Something snapped in May of 2010 for me, probably another button off the waistband of my pants. Whatever, but I decided to get healthy and in shape. I knew that my habits were against me and I needed to change my behavior. I had to develop key performance indicators that I could track to help me achieve my goals and my tool was going to be Excel®. Really, I can’t figure why my wife Jaci says I am so much of an engineer about everything. Take a look at the chart below. I started on June 1, 2010 at 217 lbs. On September 2, 2010 I weighed 177 lbs. That is not the story. The story is that tracking the KPIs is what greatly helped me achieve the goals – and if I continue – will help me get to 167 before January 1, 2011. I wanted to get in athletic shape and be healthy. This was a good goal but it is general and hard to measure – however, maintaining a healthy weight and being able to run a marathon are good indicators of being in shape. These are the parameters that I chose as KPIs. There are two main KPI types or uses. One KPI is used to achieve a goal; the other is used to maintain a goal or level of performance. You will see that I set up most of my goals and KPIs to achieve a goal but then to transition to maintaining level of performance. You will see this in my charts in figures 1-3. I was beginning at 50 or more pounds overweight and couldn’t run a mile in a decent time. My goal had to be set to be increasing or decreasing from where I actually started. My first step was to set “Weight”, “Miles Run”, and “Calories” targets that would take me to my maintenance area. Weight: My first goal was to lose weight at a target of ½ pound per day until I lost 50 pounds or got to 167 lbs. To be honest I didn’t necessarily want to lose fifty pounds – but it would be more impressive when I was telling people about it and it looked good on my chart. I also didn’t necessarily want to lose weight continuously at ½ lb per day – but to taper off more slowly to transition from weight loss to maintenance. 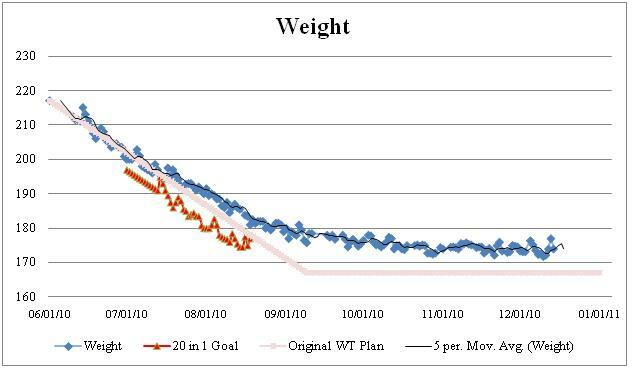 See Figure 1 Weight Plan and Weight trend lines. You will also see on the chart above that wanted to increase my average calories intake over time. I felt that would be better for my ability to maintain my weight and to help ensure I got the fuel needed for running. On a side note – I think McDonalds gets a lot of bad press about their food. A McDouble sandwich for $1.00 has only 410 calories. A small fries for $1.00 is only 231 calories. Add a small diet drink and you can have a fast lunch of only 641 calories for $3.00. Bottom line – many of us cannot maintain a special diet but tracking calories per day (www.CalorieKing.com) is good enough to keep us on track. Running: Simultaneously, I set a goal to follow a plan to be able to run a marathon in six months. You will see my running chart in Figure 3. I met the goal of being prepared to run a marathon in six months. I ran several half marathon distances and beyond in training. The week before my scheduled marathon I ran the Paris Mountain 20K in Greenville, SC. Unfortunately, that run was enough to really inflame the very painful bursitis I had developed in my right hip. I am now running less but preparing for a marathon in February. Beyond the right KPIs I needed the right tools and the right process to use the KPIs to achieve my goals. Look at the performance charts every day – there is something special about “seeing” this data in a chart or trend. I want to add special emphasis on visualization. I personally feel that the right trends and graphs transfer information and motivate at an almost emotional level. KPI charts must be viewed every day by the people responsible for meeting those goals. I have heard of people publishing their weight loss to friends and family for motivation. If it works then do it but I feel that this type of goal is clearly only controlled by one individual. That one person should look everyday at the charts and graphs of the KPIs to achieve their goal. 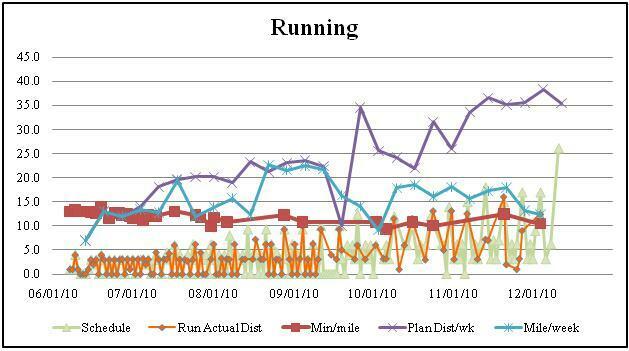 I used business tools like KPIs and visual charts to help me lose weight, run better and thereby get in better health. I think the use of the KPIs and charts in a tool like Excel® will help others lose weight. But the same principles apply to achieving any goal – personal or professional. Use notes and exceptions to explain anomalies in the charts rather than not recording the data. Things happen – we miss a run, Friday is pizza night, or we have bad raw materials. No one likes to chart failure even if they are the only ones seeing the information. It is very important to capture the information and add notes of why anomalies happen rather than ignore the information. Visualization is more important than most people realize and too important to have last week’s data on bulletin board in the office. Whether it is weight loss or production rate the information should be seen – and understood – by those responsible in near real-time. Notes can explain anomalies but everyone should see how they are performing. Kevin Totherow is a Business Development Manager of MES for Schneider Electric and a consultant for helping manufacturing clients manage their operations better. Kevin has been a controls engineer, consultant and president of Sylution Incorporated. He can be reached at (864) 252-6819 or by email at kevin.totherow@schneider-electric.com. Great story on your weight loss and the KPI’s! Thanks Tony. Wishing you and your family a Merry Christmas and looking forward to working with you in 2011.